Book Review: Ann Blyth: Actress. Singer. Star. 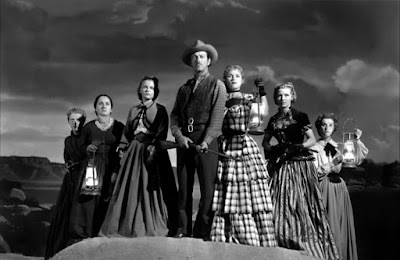 Tonight was a very special evening in the William Wellman series at UCLA, with a double bill of two classic Westerns, WESTWARD THE WOMEN (1951) and YELLOW SKY (1948). Both films were introduced by the director's son, William Wellman Jr., who loves both these films, especially WESTWARD THE WOMEN. 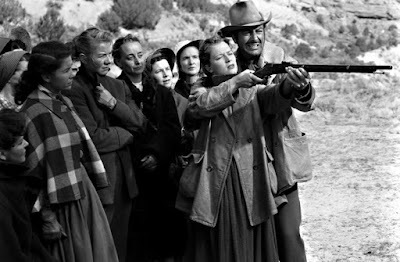 When he returned to the podium to introduce the second film, YELLOW SKY, he was clearly still moved by the experience of seeing WESTWARD THE WOMEN again. 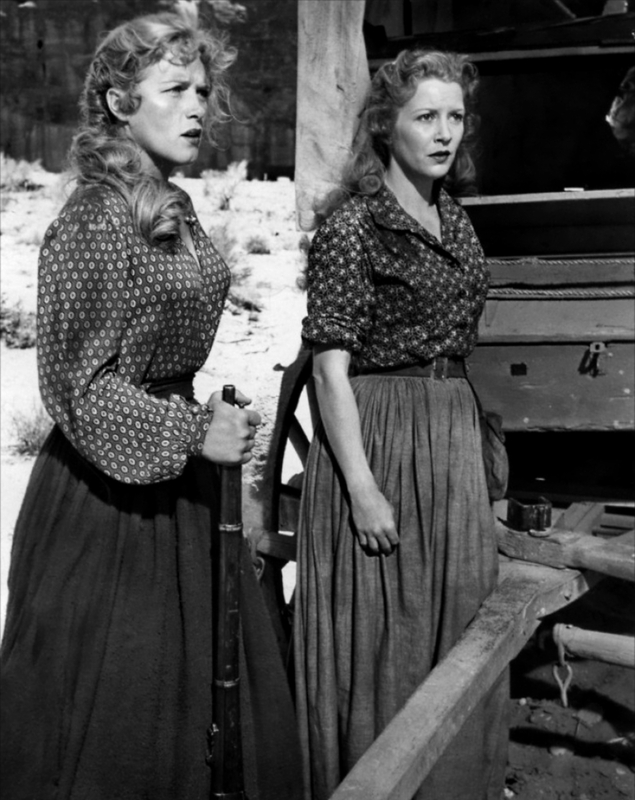 WESTWARD THE WOMEN went onto my list of favorite films quite some time ago, but nothing can match the power of this stirring film as seen on a big screen. When it was almost over I realized that, despite having seen this film multiple times, I had been completely, totally absorbed in the film; my mind never wandered once. The movie is gritty, tough, and realistic, with a wonderful ensemble cast. The emotional payoff of the ending, after all that has gone before, brought well-earned tears to my eyes. This is a very, very special film. 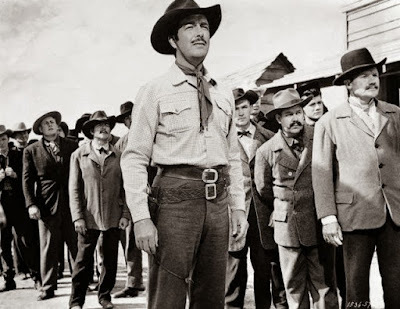 Below is a gallery of images I've collected of the film, which stars Robert Taylor, Denise Darcel, and Julie Bishop, along with a large supporting cast. It was filmed in Kanab, Utah. 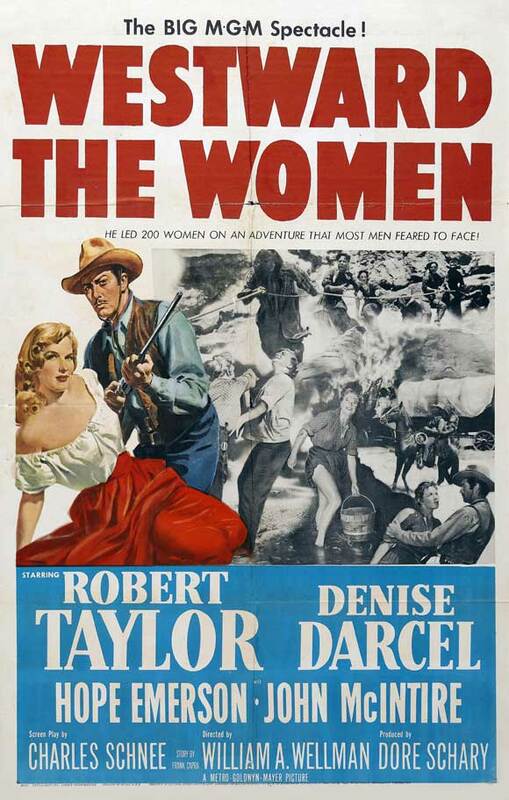 WESTWARD THE WOMEN is available on DVD from the Warner Archive. You can read more about the movie in my 2007 review. Most highly recommended. Sounds like a wonderful and moving occasion, Laura. I am so envious that you have these opportunities on your doorstep. Those wonderful stills are really pushing me to dig out my copy of WTW and check pq, see whether it is OK or whether a WA purchase is needed (my memory is that my copy is good but for this film only the best will do). It is way too long since I watched it. Seeing it on the big screen would be terrific though. Ho-hum. 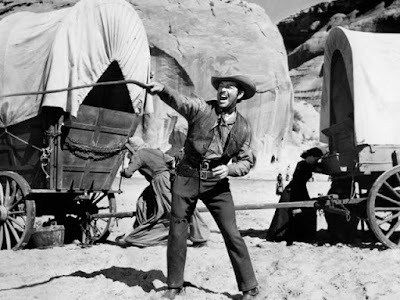 I too must look out my copy of this western. Loved the stills. 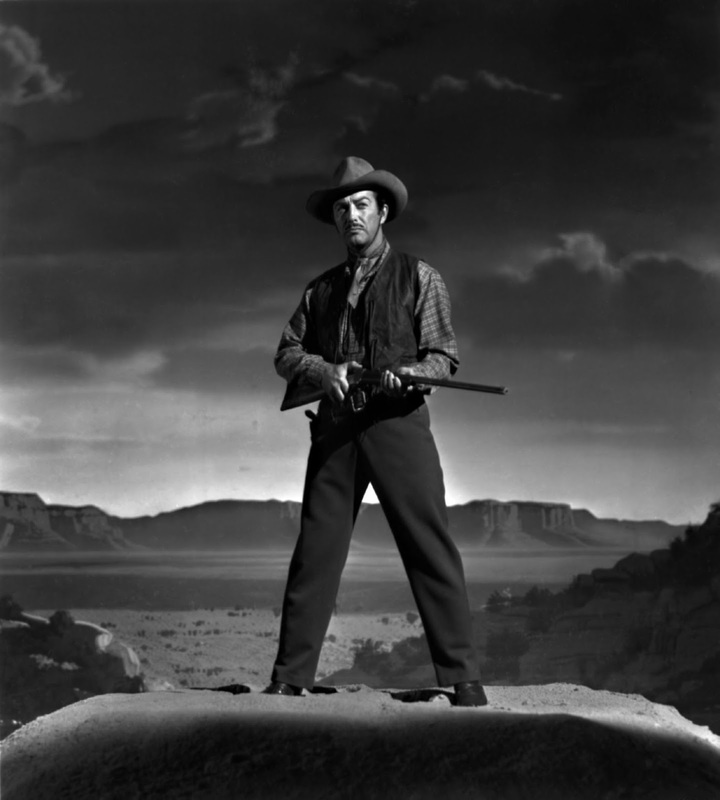 I envy you meeting William Wellman's son. Was there a Q&A? It was nice seeing you over there, Laura. I think we both responded much the same way to this big screen viewing. I must admit that I've gotten very used to watching movies at home lately, and this was kind of sobering. I've always loved WTW but had not seen a 35 print on the big screen before. So much of it is in beautiful long shots and wide shots rich with great detail and it's just inevitable that this will all come over best on the big screen. Also, you can really get lost in the world of the movie seeing it this way and that counts too in something that is so moving as this--tough and rugged as you say, and it's for just the reason that it is so unsparing that the warmth and tenderness in the payoff sequence at the end are so wonderfully affecting. My wife Linda loves a lot of Westerns too but told me after we left she still gives this one pride of place among all the other great ones. I believe she and I agree that no other movie in any genre does just what this does with a group of women. Interesting and kind of sobering how the post-feminist age could never even come close to what it does. And I was pleased when William Wellman Jr. told me he too believes it is his father's best Western, with Yellow Sky a close second, which is exactly how I would rate them. Jerry, it really was a moving occasion. I often wish that some of you who regularly comment here could also be a part of such an experience, as I know it would be so appreciated. Vienna, there wasn't a formal Q&A in the theater, but Mr. Wellman has been available beginning an hour before each screening to sign his book and simply chat. I had a nice talk with him Saturday afternoon about topics including my having enjoyed his lecture in Lone Pine last fall, my love for WESTWARD THE WOMEN, and being charmed by his parents' love story as recounted in his new book. Blake, it was wonderful to see you and Linda last night, and I hope we'll meet again very soon. This screening was such a powerful experience, becoming lost in the world of the movie is a great way to put it. 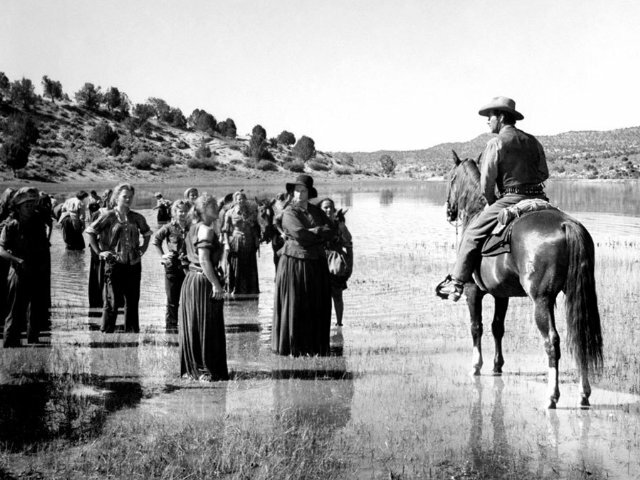 WESTWARD THE WOMEN joins WINCHESTER '73, STAGECOACH, and MY DARLING CLEMENTINE as some of my favorite movie experiences of the last 18 months. There is something about seeing those majestic black and white vistas on a big screen that simply can't be matched at home, much as I appreciate all that's available to us to watch on our TV screens. I agree also on the ranking of WESTWARD THE WOMEN and YELLOW SKY. Mr. Wellman also told me Saturday that ISLAND IN THE SKY was one of his father's very favorite films which was nice to hear, given how much I appreciate it and think it's a rather underrated gem.